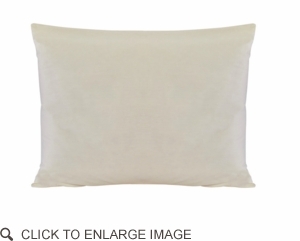 • This cloud-like pillow gently caresses your head and supports your tired neck. Tightness and stress in muscles slowly disappear like the sun sinking behind the horizon. • Sleeping with the 100% natural wool and cotton pillow means waking up with more than a different and wild hairstyle that morning. It means feeling energized, refreshed, and relief from stressed muscles. • Say “good night” to overheating, sweating, and that clammy feeling. • Say “good night” to clumps and bumps in a pillow. ensitivities) as they are free of carcinogenic chemicals. • Last for many years with proper care. Wool out-performs other fibers used for bedding. • Filled with 100% washable wool. • Encased in 100% natural cotton, 270TC percale. • Comes in eco-friendly and reusable packaging. • Sizes: standard, queen, king. Standard: 20 x 26"; wool fill: 2.5 lbs. Queen: 20 x 30"; wool fill: 3 lbs. King: 20 x 36"; wool fill: 4 lbs.